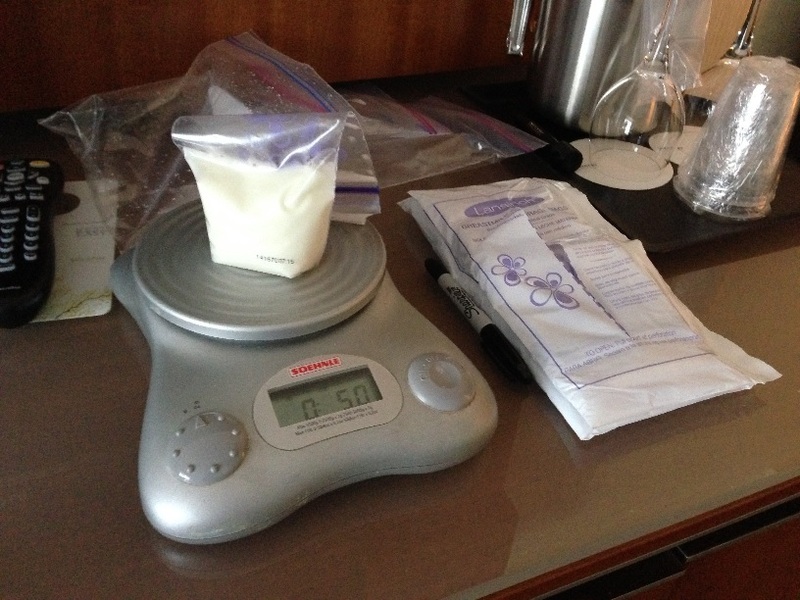 To keep track of how much I am pumping and be sure that I am not over (or under) filling the breastmilk storage bags, I use a digital scale to weigh expressed milk when I am traveling. Then, I immediately transfer the pumped milk to freezable storage bags. I label the bags using a Shapie I carry in my pump bag. When I am putting in milk from pumping sessions that cross over days (i.e., topping off the bag from the night before with the milk pumped the next morning), I always put the date representing the oldest milk in the bag. For trips of less than a week, I usually keep milk in bags in a refridgerator in my hotel room and bring them home as liquid. I have never been in a hotel that was not able to accomodate me. For longer trips, hotels will freeze the milk in bags and I generally use 2-gallon, zip-top storage bags to contain all of the individual milk bags. Weighing and packing milk in London, January 2015.